I am an amateur shower singer, and like most others I have ever heard, my repertoire is limited to the lyrics of first verses, followed by a lot of humming. I tend to get stuck on a certain song for a while, and for about a month now, I've been on continuous repeat of the songs of South Pacific. A few weeks ago, in the midst of my third round of “I'm gonna wash that man right outta my hair...”, I discovered that my 96 year old roommate had used up the last of the shampoo. Fortunately, like most of you, I have a collection of tiny bottles from hotels, just waiting to justify their existence. This was their big moment. Unfortunately, they aren't within reach of the shower, so I got out, leaving puddles all over the floor, and after scrounging through the miscellaneous stuff (in the recently demoted food storage containers) under the sink, I found the sleek little bottle that I brought back from a posh place in Montreal a few years ago. I assumed it was shampoo, but since the tiny words were in French, and my hair was wet and in my face, I was mistaken. It turned out to be body lotion. Strongly scented body lotion. Eau de someone's great-aunt-Minerva's perfume. When you've been traveling and finally get to the room at your hotel, is the bathroom, and it's offerings, one of the first things you check out? Can you document your trips for the last few decades through a slew of shampoos, conditioners, and tiny bars of soap? It seems to be human nature to collect these. But why? They are cute and little, and people are attracted to cute little things. We hate wasting stuff, so if we've opened it, we take it home, with the intention of saving it from being wasted. I rarely leave town these days, but have made a pact not to accumulate any more hotel amenities in the future. I just don't need them. They serve no purpose in my life. I don't wear shower caps. I've got my own sewing kit. My hair prefers the same grocery store shampoo that I've been using for years. I pack my own stuff when I travel. What can we do with them? Well, the obvious answer is to use them up and recycle the bottles, but if you doubt that you will really do this, think about donation opportunities in your community. Personal care items are expensive and your hotel souvenirs could be better utilized if they moved out of storage in your bathroom closet. Donate to homeless shelters, organizations that support people in leaving violent relationships, group homes for people with developmental disabilities or mental illnesses, half-way houses, senior centers. You may not be aware of these places in your community, but they exist. 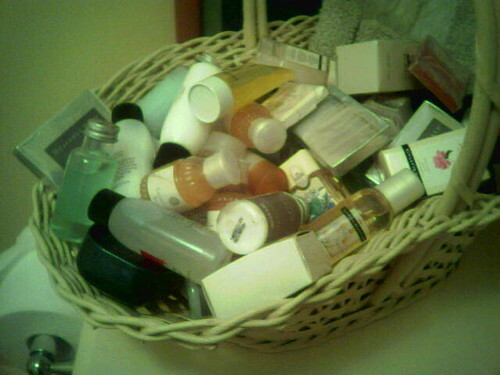 Your local food shelf might welcome unopened lotions, shampoos, and conditioners. I am pleased to share that there is something else you can do on a more global scale! When you book your next reservation, ask if the hotel is a hospitality partner with the Clean the World Foundation. This Orlando, Florida based charity, founded in 2009 reduces waste from discarded hotel soap, shampoo, conditioner, and lotion products, collects and sanitizes them, then redistributes to homeless shelters and impoverished countries, supporting the prevention of hygiene-related illnesses around the world. If you want to learn more about how your half-used bar of hotel soap could be “washed” on its way to a child in Haiti, check out their website. It's easy to search for participating hotels in a specific location too, so you'll be able to leave that soap behind, without any reservations.